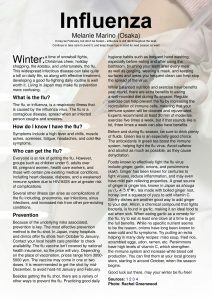 It may be February, but don’t be fooled – influenza is still rife throughout the land. Continue to take care to avoid it, and keep these tips in mind for next season as well! Winter: a time of snowball fights, Christmas cheer, holiday shopping, the kotatsu, and unfortunately, the flu. This widespread infectious disease can take quite a toll on daily life, so along with effective treatment, developing a good flu-fighting daily routine is well worth it. Living in Japan may make flu prevention more confusing. 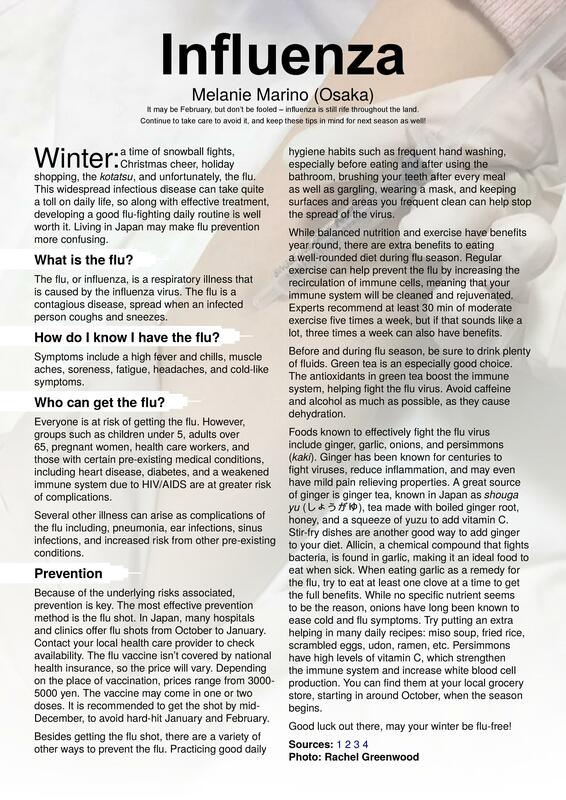 The flu, or influenza, is a respiratory illness that is caused by the influenza virus. The flu is a contagious disease, spread when an infected person coughs and sneezes. Symptoms include a high fever and chills, muscle aches, soreness, fatigue, headaches, and cold-like symptoms. Everyone is at risk of getting the flu. However, groups such as children under 5, adults over 65, pregnant women, health care workers, and those with certain pre-existing medical conditions including heart disease, diabetes, and a weakened immune system due to HIV/AIDS are at greater risk of complications. 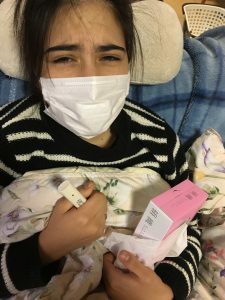 Several other illness can arise as complications of the flu including, pneumonia, ear infections, sinus infections, and increased risk from other pre-existing conditions. Because of the underlying risks associated, prevention is key. The most effective prevention method is the flu shot. In Japan, many hospitals and clinics offer flu shots from October to January. Contact your local health care provider to check availability. The flu vaccine isn’t covered by national health insurance, so the price will vary. Depending on the place of vaccination, prices range from 3000-5000 yen. The vaccine may come in one or two doses. It is recommended to get the shot by mid-December, to avoid hard-hit January and February. Besides getting the flu shot, there are a variety of other ways to prevent the flu. Practicing good daily hygiene habits such as frequent hand washing, especially before eating and after using the bathroom, brushing your teeth after every meal as well as gargling, wearing a mask, and keeping surfaces and areas you frequent clean can help stop the spread of the virus. While balanced nutrition and exercise have benefits year round, there are extra benefits to eating a well-rounded diet during flu season. Regular exercise can help prevent the flu by increasing the re-circulation of immune cells, meaning that your immune system will be cleaned and rejuvenated. Experts recommend at least 30 min of moderate exercise 5 times a week, but if that sounds like a lot, 3 times a week can also have benefits. Before and during flu season, be sure to drink plenty of fluids. Green tea is an especially good choice. The antioxidants in green tea boost the immune system, helping fight the flu virus. Avoid caffeine and alcohol as much as possible, as they cause dehydration. Foods known to effectively fight the flu virus include ginger, garlic, onions, and persimmons (kaki). Ginger has been known for centuries to fight viruses, reduce inflammation, and may even have mild pain relieving properties. A great source of ginger is ginger tea, known in Japan as shouga yu (しょうがゆ), tea made with boiled ginger root, honey, and a squeeze of yuzu to add vitamin C. Stir-fry dishes are another good way to add ginger to your diet. Allicin, a chemical compound that fights bacteria, is found in garlic, making it an ideal food to eat when sick. When eating garlic as a remedy for the flu, try to eat at least one clove at a time to get the full benefits. While no specific nutrient seems to be the reason, onions have long been known to ease cold and flu symptoms. Try putting an extra helping in many daily recipes: miso soup, fried rice, scrambled eggs, udon, ramen, etc. Persimmons have high levels of vitamin C, which strengthen the immune system and increase white blood cell production. You can find them at your local grocery store, starting in around October, when the season begins. Good luck out there, may your winter be flu-free!